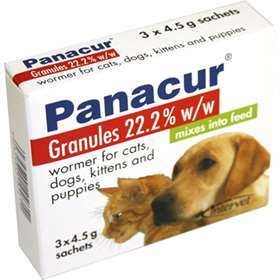 Panacur Wormer Granules 4.5g 3 is worming treatment for heavier cats, dogs, kittens and puppies infected with gastro-intestinal roundworms and tapeworms. Wormer for cats, dogs, kittens and puppies. Treats protozoa giardia in puppies. Contains active ingredient fenbendazole 22.2% w/w. Can treat an animal of 30kg (66lb) bodyweight on a single occasion. Treats toxocara canis, toxocara cati, toxascaris leonina, ancylostoma, trichuris, uncinaria and taenia. Panacur Wormer Granules 4.5g 3 acts by preventing the worm from absorbing its food, starving the worms. Whole worms can occasionally be passed for up to 6 days following treatment. Directions for use: Each 4.5g sachet of Panacur Wormer Granules will dose up to 10kg (22lb) adult bodyweight in adult cats and dogs. For dogs weighing over 30kg (66lb), an extra 4.5g sachet is required for each 10kg (22lb) of bodyweight. Administer 1 sachet per 10kg (22lb) as single dose. Each 4.5g sachet will dose up to 20kg (44lb) bodyweight in weaned puppies and kittens under 6 months of age. Administer 1 sachet per 20kg (44lb) daily for 3 consecutive days. Precautions: Direct contact with the skin should be kept to a minimum. Wash hands after use. Avoid inhalation of granule dust. Keep sachets in outer carton.